Explore Gwinnett is pleased to announce the final list of 2013 Gwinnett Restaurant Week participants. Five new restaurants include Marlow’s Tavern, Three Blind Mice, Graft Restaurant, Mojito’s and The Georgia Pine. The promotion takes place Monday, July 22 - Thursday, July 25, 2013. 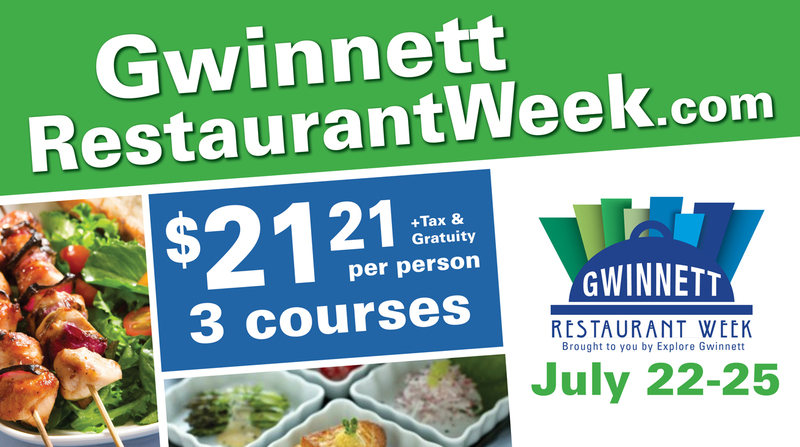 Now in its 7th year, Gwinnett Restaurant Week features 15 restaurants, each offering a three-course meal for just $21.21 (plus tax and gratuity), a savings of 20-35%. Reservations for some restaurants can be made online and others by phone. Diners can view all Gwinnett Restaurant Week menus at www.GwinnettRestaurantWeek.com. New this year, social media savvy diners will have the opportunity to get small prizes during Restaurant Week by checking in via the Yelp! App. Valid only at participating restaurants and details can be found on the website. To receive email updates for Gwinnett Restaurant Week, sign up for the e-newsletter at www.GwinnettRestaurantWeek.com.